I've been the happy owner of an iPod nano 5th gen, 8Gb for a few years. Over the years, I've added and deleted many songs, lyrics, album art, etcetera, and I recently assumed that something was corrupted in the drive: when I would add new album artwork to a song, it would either not work or add the album art of one song to a lot of other totally unrelated songs. This thread is excellent to start troubleshooting, but didn't really help on a iPod nano (diagnostics mode is limited on this model). Permissions Repair (or actually "First Aid" as it is now called) didn't find anything. So I backed up all the songs I had on the it to my MBP. I also checked that the files were not corrupted. I would like to restore the device the best possible way, before I put the tracks back on it. When I launched the (brand-new) El Capitan's Disk Utility, there was a new setting I hadn't seen in previous versions, called "scheme". I'm not really sure which one to use for an iPod nano, and couldn't find anything online. The best way to handle an iPod Restore is to do it from iTunes. iTunes knows what it is & how to format it - it will even actually format differently depending on whether you have iTunes on a PC or Mac, to enable easier file handling afterwards. If it's a model with a lock switch at the top [red dot visible] switch the lock off first [white dot] - Some models will crash if you don't. Plug it into the computer, launch iTunes if it doesn't launch automatically. Click the device icon in the top bar, choose the iPod if you see multiple devices listed. Click Restore. Follow the onscreen instructions. You will need to resync afterwards. X to be replaced by the corresponding device number. Good look! It took me a while. Nothing I found online seemed to work out for me. So I finally went down trying the trusted old diskutil command, worked like a charm. The nano was immediately recognized in iTunes. Not the answer you're looking for? 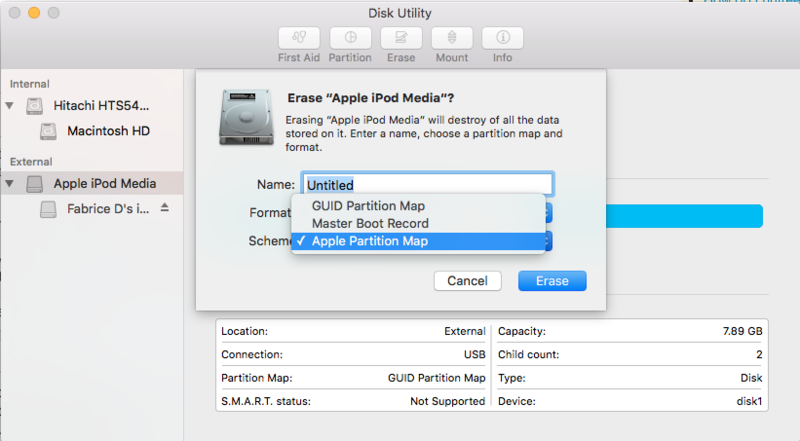 Browse other questions tagged disk-utility music ipod disk-format ipod-nano . Why can't I shuffle songs within a specific album under the latest version of iTunes 12.5.1.21?